Have you ever wanted to learn sign language, fashion a bonsai tree, surf fish, make a perfect clam chowder, stay out of the doctor’s office, paint sand dune scenes or write the great American novel? 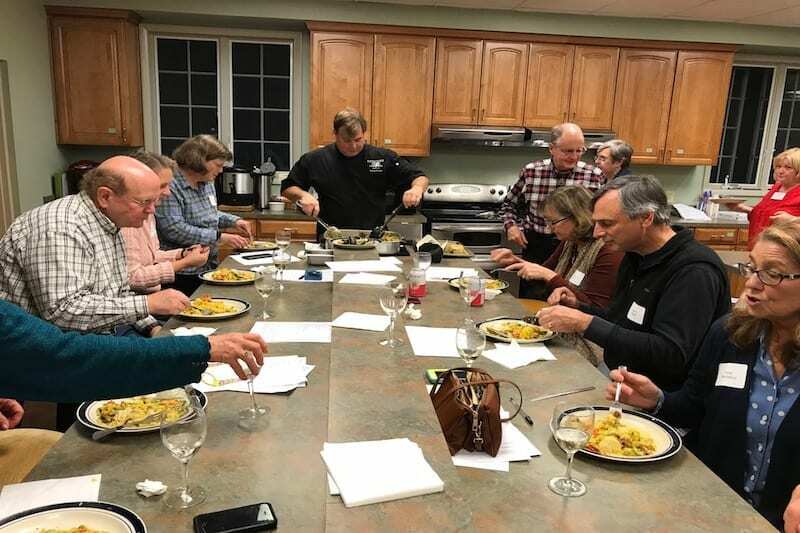 Now in its 10th year, the annual “After Dark” series at All Saints Episcopal Church launches Jan. 28 with 78 classes taught by local professionals for local residents, all for a good cause. In its first nine years, the $23 price-per-course event has raised more than $116,000 for charity on the Outer Banks, said Tim Mckeithan, one of the event’s organizers. The funds are distributed through the Southern Shores church’s Servant Ministry Committee, with donations going to the Beach Food Pantry, Room at the Inn, the Outer Banks Relief Fund, Mano al Hermano and more. It began as a way to beat the winter blues on the Outer Banks, where cold winds and empty businesses can make the off-season feel long and dark. After Dark is so popular, 28 classes are already filled, most of them cooking courses. But there are plenty more, on topics including landscaping, painting, storytelling, wine education, wellness, financial matters, Constitutional law, computer and iPhone literacy, music, flower arranging and even Chinese veterinary medicine. The courses run Jan. 28 through March 1, most of them starting at 7 p.m. Each class costs $23, with many including a small materials fee. Learn to make creamy chocolate pecan caramel turtles, taught by the Geof Foundation, which has been fine-tuning the confection for 20 years. Home brewing basics for those interested in making their own beer, taught by brewer Tom Welch, who helped establish the the OBX Homebrewers Club. Sous chef Jamie Pauls of Blue Water Bar and Grill will share how to cook up his New England clam chowder, a restaurant favorite. Chef Joey Russo will take you to Scandinavia with a class on making gravlax, cured Scottish salmon. Chef and Level II sommelier Dan Lewis of Coastal Provisions provides a wealth of information on wine in his tasting class. Sandy Sanders, owner of Sanders Farms in Jarvisburg and president of the Albemarle Bonsai Society, will present a demonstration of the bonsai process from start to finish. Stu Baldwin, a recreational angler who has participated in more than 35 surf fishing competitions, will give a class for novices, sharing his knowledge of such things as proper equipment, rod and reel selection, knot tying and how to read a beach. Dr. Christina Bowen will host a class on how to stay out of the doctor’s office, with positive lifestyle modifications for body, mind and spirit. Feel like you’re not mobile or flexible enough for yoga? Instructor Fred Pifer will teach a class on chair yoga, where you can learn to increase balance, flexibility and peacefulness, even while sitting down. Reflexology is more than a foot rub. Marty Hamed, a board certified reflexologist, teaches techniques to use on friends and family to promote greater well-being and relaxation. Award-winning writer and college English instructor Shone Kirkpatrick offers a presentation on how stories are told and how they work. Art teacher Francie Hayman teaches a class on fluid painting, a trend using acrylic pour paint. Learn all there is to know about using iPhones and iPads. Technology guru Tom Odom gives a review of what the Apple devices are capable of and how to make them do it, as well as basic commands and navigation. Botanical artist Barbara Hanft and heirloom quilter Cil Deming will teach you how to make faux parchment note cards, using items from the pantry. Learn to knit with Peggy Clifford, or refresh what you already know. You’ll get your start by making a colorful dishcloth, beautiful and practical. Have you always been intrigued by American Sign Language? Taught by Elizabeth Allen and Melinda Gallagher, this class will go over fingerspelling, how to introduce yourself to a deaf person, and some grammatical features of ASL. Dr. Jessica Stumph, practicing veterinary medicine for over a decade on the Outer Banks, takes a look at traditional Chinese veterinary medicine for your pets. Larry Proctor gives a “how to” on studying genealogy, with a focus on using digital technology to find out about the past.